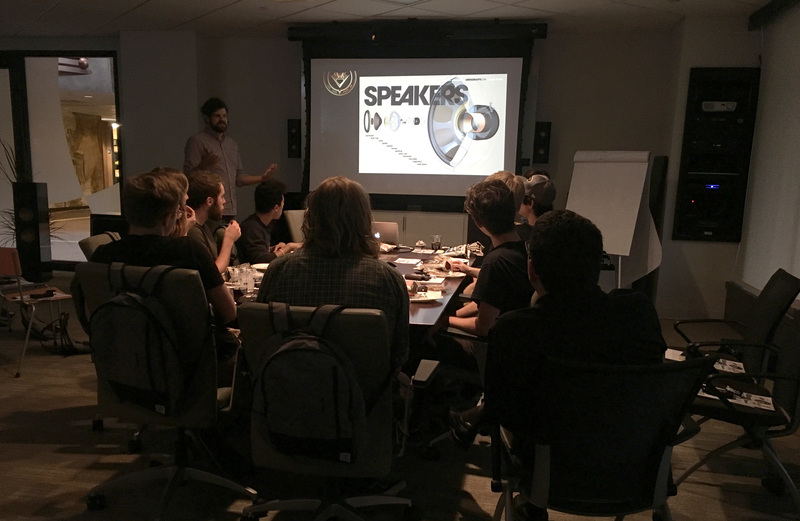 Recently the Purdue University chapter of the Audio Engineering Society paid a visit to Klipsch headquarters. Led by Home System Separates Product Manager, Michael Buratto, students took part in an interactive presentation about how a speaker goes from ideation all the way to the retail floor. The goal was to educate students about the exciting “real world” engineering and business opportunities in the speaker industry. Director of Program Management Andre LaRouche, stated, “This is exciting. As a former AES Student Chapter President at Michigan Tech, I can attest to the fact that these student chapters produce passionate audio focused engineers and team members." So, what were the key takeaways? Students walked away with a better understanding of the initial product concept, product development and review process, and launch into the market. The process is all hands-on deck from: industrial design, marketing, customer support, finance, engineering, production, logistics, and sales. Everyone plays a crucial role in delivering the product to the end user. Everyone has a passion for audio. Everyone is a team player. Do you know a student who is passionate about audio? Or someone who is considered a maverick in their field? We are looking for the next Paul W. Klipsch. Will you help us find him? To find out more, check out our PWK Scholarship.